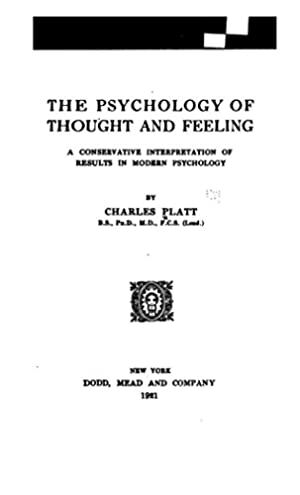 The Psychology of Thought and Feeling, a Conservative Interpretation of Results in Modern Psychology by Charles Platt. This book is a reproduction of the original book published in 1921 and may have some imperfections such as marks or hand-written notes. We started tracking this book on July 27, 2016. The current price of this book is $9.90 last checked 10 hours ago. We last verified the price of this book about 10 hours ago. At that time, the price was $9.90. This price is subject to change. The price displayed on the Amazon.com website at the time of purchase is the price you will pay for this book. Please confirm the price before making any purchases.